When I have had conversations with my friends and with customers in Second Life I realized that people are able, but do not know how to set their viewer to see their jewelry in the best way. 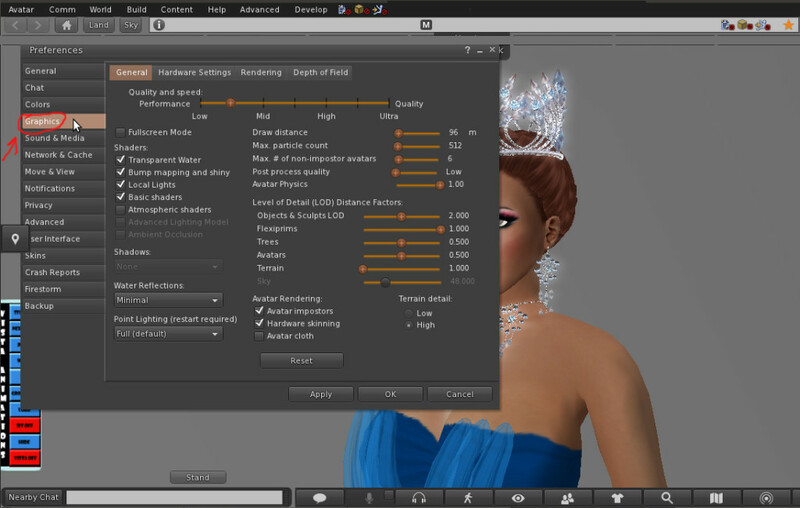 That happens because during the first installation of the viewer system configure it to as high of graphic settings as possible, but unfortunately such autosetting in most cases is not good to to view your jewelry as pleasingly as possible, but it takes just 5 steps to correct the situation. In this article, I will share the SECRET with you! At the beginning of this article I put a picture that shows how jewelry looks when the graphic settings are adjusted correctly. Next, I will show you examples of incorrect adjustments, and finish by showing you how to make the correct ones. All examples were made using the Firestorm 4.4.2 viewer, but you can easy find same settings in other viewers, too. As you can see jewelry looks dark and flat with LOW graphic settings. This looks better than a low setting, but some jewelry still hasn’t the beautiful shine it should have. You can see that this settings do not make significant difference in comparison with MIDDLE graphic settings. Step #1: Go to your viewer menu and find AVATAR settings in the upper left corner. Left click on it. Step #2: From the menu, choose PREFERENCES and again, left click. You will get a special window with keys to all viewer settings. Step #4.1 Move the graphic settings slider to the position between LOW and MID graphical settings as shown in this picture. Step #5: Click OK. Congratulations! You did it! You set up the best settings for viewing jewelry in your viewer! P.S. Also, in addition to making the jewelry look more beautiful, the performance of most computers will improve, depending upon the specific hardware. As the creator of your jewelry, I will be happy because you will see my work in its full glory, as I conceived it while designing it for you.